Diamond Details: Round brilliant cut white diamonds of G-H color, SI clarity, weighing .68 carat total and very fine round cut fancy pink diamonds, weighing .04 carat total. Earring Details: Simon G 18k white and rose gold floral design with antique style caviar beading. Measurements: 19mm in length and 10mm at the widest point. 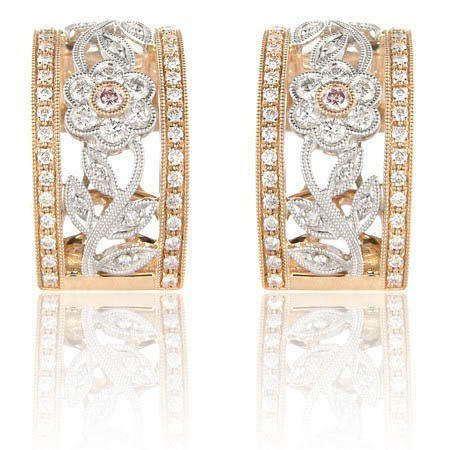 These stunning Simon G antique style 18k white and rose gold floral earrings contain round brilliant cut white diamonds of G-H color, SI clarity, weighing .68 carat total and very fine round cut fancy pink diamonds, weighing .04 carat total. Beautiful caviar beading, creates an antique style effect. These earrings contain post and omega clips and measure 19mm in length and 10mm at the widest point.